Sidlesham won on the road - but Bosham lost to their bogey team. Here are the latest reports from our local SCFL division-two teams. Sidlesham gained maximum points on their travels against a well-organised Ferring side. Both teams went at it from the off with Davidson Borges and Dan Bassil going close for Sids. At the other end Matt Roberts and Tom Kelly had to be at the top of their game to keep Ferring at bay and with Connor Kelly in fine form behind them this was to prove the foundations for the win. Kelly saved acrobatiacally after his brother’s clearance cannoned off a Ferring player and flew towards the top corner. In the second half Bassil put Sidlesham one up when turning and firing his shot wide of the despairing dive of the home keeper. Then Kelly produced a even better save to get his foot to a hotly-disputed penalty. Not long after this Sidlesham got their second as debut-making youngster Joe Bennett produced a great cross from the left for the impressive Roberts to head home. Niah Mckenley-Burke and Borges both went close for Sids in the remaining minutes. Sidlesham visit Cowfold in the Intermediate Cup first round on Saturday (1.30pm). 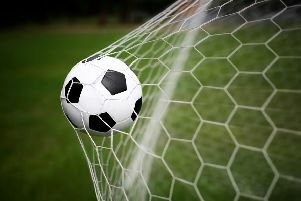 Bosham’s Jarvis Brook jinx struck again as Bosham crashed to another close defeat to a team who have now beaten them four times in a row. A late strike from Jake Bloomfield snatched the points for the Blues at the Limekiln. The home side took the lead after nine minutes through Tom Saunders. The striker was left unchecked in the Bosham area and needed no second invitation to slam home a drive. To their credit the Reds pushed on and went close thanks to the dangerous Callum Coker. The striker was put through on goal by Benn Neal but the keeper, player-manager Rob Gordon, made a good save. Jarvis Brook sped up the other end and Daryl King got in on goal but Nick Hall was big enough to cause King to chip wide. Bosham were awarded a spot-kick for a clumsy foul but Gordon made an excellent save from Graeme Dowden. Just after the half-hour the hosts thought they had doubled their lead through Liam Edwards but an offside flag stopped the celebrations. The Reds weren’t able find an equaliser before the break but knew they’d be playing down the slope in the second half. The resumption saw a good deal of possession for the Robins but quality around the area was lacking. But on 68 minutes their luck turned when Daniel Lawrence turned the ball into his own net from a strong drive from Matt Docherty to see Bosham draw level. The Robins’ tails were up and the game opened up, with both sides surging forward. With just a few minutes left Jarvis Brook nailed yet another late winner against the visitors when Broomfield let fly with a spectacular volley from 30 yards wthat left Hall with no chance. Try as they might, the Robins couldn’t find another equaliser. Bosham: Hall, Smith, Neal, Hardman, Reynolds, James, Bell, Docherty, Dowden, Coker, Radmore. Subs: Wilson, Lafferty, Bedford.